The third map of this atlas is a westward continuation of the first map. As in the two preceding maps the south is depicted at the top of the map; however, most of the captions (with the exception of the main captions) face the opposite side and have to be read while looking at the map upside down. 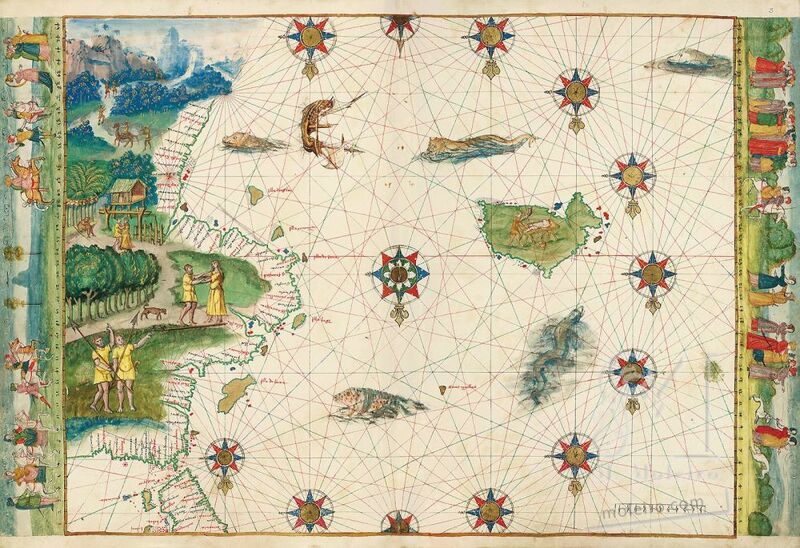 The correspondence between the coastal features represented here and geographical reality is less obvious than on the eastern coast, which is not surprising if one considers that they were almost certainly summarily mapped on different occasions and by different people. In much the same manner as on the opposite coast, the toponyms are entirely Portuguese, even though the place names have sometimes been distorted by the copyist or have been translated into French. As has already been noted, numerous toponyms are repeated on both coasts. Just like in Map 1, the illuminations have nothing in common with Australia, instead depicting scenes from everyday life in the Malay Archipelago, as Parmentier’s companions were able to observe in Sumatra. In the left half of the map, in the middle of the Indian Ocean, there is a large island called L’Ille des Geans. This is evidently the graphic representation of a medieval myth. During the sixteenth century, this “Island of Giants” was sometimes identified with the Falklands or Malvinas. In this map, the giants were supposedly cannibals, since the illumination depicts a human being with a cleaver in his fist quartering a man on a table, collecting, to all appearances, the blood in a pan. Although, rightly or wrongly, cannibalism has frequently been attributed to the most diverse communities with lower levels of culture all around the world, this could be a vestige of the cannibalism that was imputed to the inhabitants of “Java Minor”, i.e. Sumatra, by Marco Polo. The illuminations that adorn the sea are all derived from fantasy.